1. If the simple interest on a sum of money for 2 years at 5% per annum is Rs. 50, what is the compound interest on the same at the same rate and for the same time? Sum = Rs. (50 * 100)/(5*2) = Rs. 500. 2. What is the difference between the compound interests on Rs. 5000 for 1 1/2 years at 4% per annum compounded yearly and half-yearly? 3. A sum of money amounts to Rs.6690 after 3 years and to Rs.10035 after 6 years on compound interest. Find the sum. Let's assume the Sum = Rs. P.
On dividing, we get [1 + (R/100)]^3 = 10035/6690 = 3/2. P * (3/2) = 6690 or P = 4460. Hence, the sum is Rs. 4460. 4. The difference between the compound interest and the simple interest on a certain sum at 12% p.a. for two years is Rs.90. What will be the value of the amount at the end of 3 years? 5. A sum of money doubles itself at C.I. in 15 years. In how many years will it become eight times? => [1 + (R/100)]^n = [1 + (R/100)]^45. So, the required time = 45 years. 6. The principal that amounts to Rs. 4913 in 3 years at 6 1/4 % per annum C.I. compounded annually, is? 8. 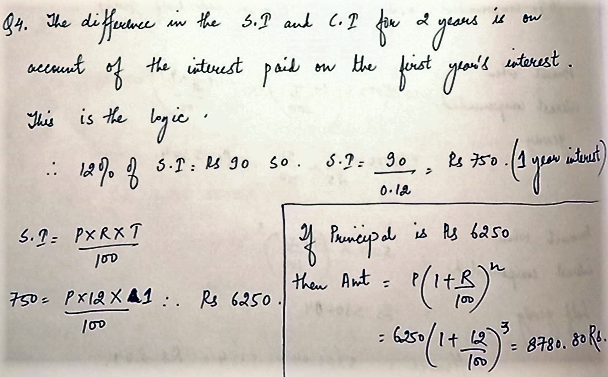 If the compound interest (compounded Yearly) on a certain sum for 2 years at 3% is Rs.101.50 then what will be the corresponding simple interest? => 605/500 = (11/10)^n => n = 2 years. 10. At what rate of interest (compounded yearly)will Rs. 10,000 amount to Rs. 12,100 in 2 years? Where Principal = P, Rate = R% per annum, Time = n years.